Remove the pork from the fridge about 30 minutes before cooking. Preheat the oven to 220°C, gas mark 7, and dry the pork with a kitchen paper towel. Check the pork skin has been thoroughly scored, and if necessary, add a few more cuts using a very sharp knife. Rub the salt thoroughly into the skin, then tuck the thyme into the centre of the meat. Place the pork in a roasting tray. Calculate the cooking time for the pork, allowing 25 minutes per 500g plus 25 minutes. Roast the pork on the highest shelf for the first hour then turn the oven down to 190°C, gas mark 5 for the remaining cooking time. Meanwhile, to cook the roasted garlic and shallots, pour boiling water over the shallots and leave for 5 minutes: this makes it easier to remove the skins. Put the whole garlic cloves in a small saucepan with boiling water and cook for 5 minutes. Run the garlic cloves under cold water and peel off the skins. Add the shallots and garlic to the pork about 45 minutes before the end of the roasting time. When the pork is cooked and the juices run clear, transfer it onto a serving plate, keep warm and leave to rest for 15 minutes. Using a slotted spoon, transfer the shallots and garlic into a heatproof serving dish, leaving behind a few of the garlic cloves to mash into the pan juices. Keep warm until you’re ready to serve. While the pork is resting, heat the butter in a frying pan and fry the pear quarters until tender and golden. After a minute or two, stir in the sugar, turning the heat to low if the pears are browning too much but still not soft. Spoon into a serving dish and keep warm. Place the roasting tray with the pan juices directly onto the hob. Scrape in any residue stuck to the pan, and mash in the garlic cloves you have left. Add the perry, bring to the boil and pour in the cream (don’t worry if it looks as though it is curdling). Let the gravy bubble and reduce until it is a sauce consistency. Add some freshly ground black pepper but no salt as some will undoubtedly have crept off the crackling. Pour into a gravy boat to serve. Spiced red cabbage and butter-soaked jacket potatoes. Heat the oven to 170°C/fan oven 150°C/mark 3. Wipe the partridges clean. Trim any claws and pull out any pin feathers. Set a large oven-proof casserole dish or saucepan over a medium heat. Add the oil. Season the flour and dust the partridge in it. Add a single layer of partridge to the hot oil and fry briskly for about 5 minutes, turning regularly until all sides are lightly coloured. Set aside in a large heat-proof bowl. Fry the remaining partridge and add to the bowl. Pour the apple brandy over the birds and set alight. Leave until the flames go out. Add 30g butter to the saucepan, followed by the sliced shallots and garlic. Gently fry over a low heat for about 8 minutes, or until soft and golden. Add 3 finely pared strips of lemon peel and the perry. Boil briskly until the perry has reduced by about two-thirds. Add the stock and boil for 5 minutes or until it has reduced by half. Stir in the crème fraiche, return to a boil and simmer until it has thickened. Season to taste. Add the partridges, breast-side down, with their juices, return to a simmer; cover with a lid or foil and place in the heated oven. 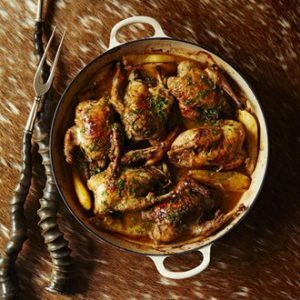 Bake for 30 minutes, then turn the partridges breast-side up and bake covered for about 20-25 minutes or until tender. Shortly before the partridges are cooked, squeeze 2 tablespoons lemon juice into a bowl. Peel, quarter and core the pears. Slice each quarter into three and toss in the lemon juice. Melt the remaining butter in a small frying pan over a medium heat. Add the pear slices and fry briskly on both sides until golden. Add the pears to the sauce, season lightly and serve around the partridges. Scatter with chopped parsley before serving. Put the pear through a spiralizer to create long spaghetti-like strands. If you don’t have a spiralizer, slice the pear into thin ribbons with a vegetable peeler, then cut the ribbons into thinner strips. Line up 4 tumblers and put 3-4 strands of pear in each one. 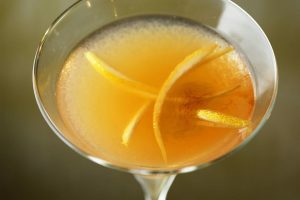 Divide the lemon juice between the glasses to coat the pear strands and stop them discolouring while you make the cocktail. Pour the Eau de Vie and hazelnut liqueur into a cocktail shaker. Add a handful of ice and shake until the outside of the cocktail shaker starts to frost, then strain into the glasses. Top with the pressed pear juice divided between the 4 glasses. Set the oven at 220C. Finely chop the rosemary leaves and crush them with the sea salt and peppercorns using a pestle and mortar. When you have a sand-like mixture, pour in three tablespoons of the olive oil to make a paste. Put the meat in a roasting tin and massage the rosemary paste into its skin and cut edges. Roast for 20 minutes, then reduce the temperature to 200C and continue to roast for 25 minutes per 500g. While the pork is roasting, peel the onions and chop them roughly. Let them cook with the remaining oil in a shallow pan over a moderate heat until soft and palest gold. Peel and quarter the pears (to keep them from browning add a little lemon juice). Add the onions and pears to the roasting tin after the pork has been cooking at the lower temperature for 25 minutes, basting the pears with any pan juices. 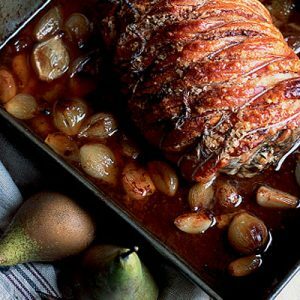 When the pork is ready, remove it from the oven and let it rest in a warm place with the pears, lightly covered with foil (a tight covering will make the crackling soften). Put the roasting tin over a moderate heat, add the perry and boil the juices until reduced to about 200ml or so. They won’t thicken, but you just want to concentrate the flavour a little. Adjust the seasoning. 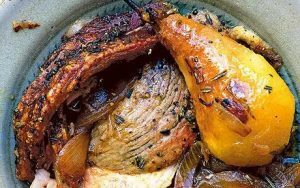 Serve the pork in thin slices, together with chunks of its crackling, pears and the pan juices. Combine all ingredients in a shaker and stir to combine. 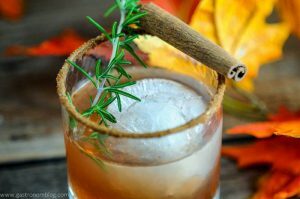 Pour over ice in cinnamon sugar rimmed glass. 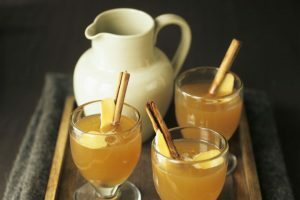 Combine the perry, sugar, orange juice, orange zest, cloves, cinnamon stick and vanilla bean in a saucepan over medium-high heat. Bring to a simmer and cook just until the sugar dissolves, 2 minutes. Transfer the mixture to the slow cooker. Add the pears and then cover with a lid and cook on low 2 hours, turning the pears halfway through. 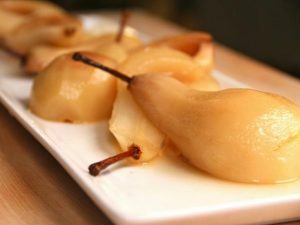 Remove the pears using a slotted spoon and transfer to serving plates or a shallow dish. Carefully strain the poaching liquid back into the saucepan and reduce the liquid by half until thickened and syrupy. Pour the reduced sauce over the pears and chill in the refrigerator an additional 2 hours or up to 2 days. Fill glasses and a cocktail shaker with ice. 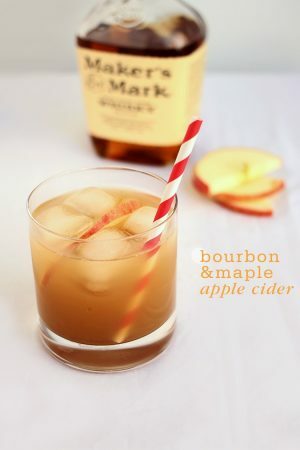 To shaker, add bourbon, lemon juice, maple syrup and apple cider; shake vigorously. 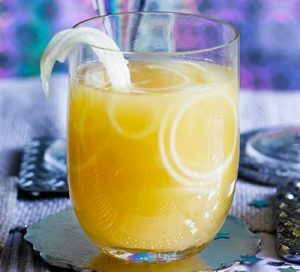 Strain into glasses and garnish each with a slice of apple. Enjoy! Toss the sweet potatoes with 3 tablespoons of oil and kosher salt and roast on a bare sheet pan for 17 minutes until golden brown and tender. 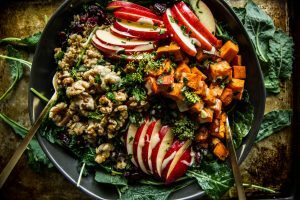 On a bed of baby kale pile the quinoa and then arrange the roasted sweet potatoes, apples or pears and walnuts on top and drizzle with the dressing.